The following is a testimony from Robert King who played an important part in the promotion of early music before his tragic "downfall" which will not be discussed here. 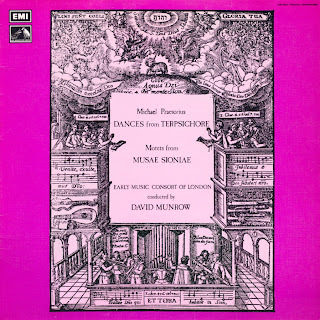 Yes, I was (and am still) a huge Munrow fan, and attended as many of his concerts as I could from about 1974 to 1976 (I even went to the Monteverdi and his Contemporaries concert at the QEH a few days before Munrow's death). I was only a schoolboy then, but I loved his radio shows, loved his recordings (I think I have all of them! ), thought his book was a magnificent work (though I have a signed copy it was autographed, since I was at Boarding School, in my absence) - in short he was my total hero. Perhaps more significantly, he was more responsible than anyone else for my going into the period instrument world. I was already captivated by its sounds, but for me, Munrow was like an electric light being switched on. His style of committed, enthusiastic, professional presentation rubbed off on me, as did his stylish, well constructed concert programme planning. Following (rather poorly) in his footsteps, as a teenager I taught myself to play all sorts of renaissance woodwind instruments, and then, since I couldn't afford to buy many of them, I taught myself how to make them - I taught my self woodturning and made crumhorns and cornamuses and kortholts, and also enjoyed a flourishing trade in gemshorn making (I made these for many shops and clients across the world, and even saw one of my gemshorns in someone's cupboard recently that he had bought from a shop in Australia that I supplied - ironically that man is now a Trustee of TKC!). I gave lecture-recitals in which I played dozens of folk and renaissance woodwind instruments that I'd collected from across the world. In the end when TKC got going properly and became a baroque orchestra, rather than a renaissance group (which is sort of how it worked before it became TKC, if you see what I mean), my wind playing ceased (I was a pretty lousy player, to be honest) and I sold most of the bought instruments so that people would play them regularly. I don't think that many of my playing colleagues in TKC worked for Munrow - almost everyone who plays for TKC is younger than me. Of course James Bowman is perhaps the most in the know of Munrow (though I have never got out of James very much about Munrow - he basically just said something like "David went mad" and that was it) but he has occasionally recounted a few amusing stories of Munrow teasing Chris Hogwood whilst on tour. And James still keeps in touch with Gillian Reid, I believe. And Jasper Parrott surely must know a few stories as he looked after EMC. Sadly I didn't meet Munrow in person, but such was his magnetic personality that I felt that I had: when he died I (as a 15-16 year old) was absolutely devastated.